This picture is here by courtesy of Garry Jones and with the permission of Tameside Local Studies Library. It shows the Hollinwood Branch Canal at Daisy Nook, near Ashton under Lyne. The canal next crosses the River Medlock by means of the impressively high stone aqueduct, named Waterhouses Aqueduct after the small village which was once alongside the river in Daisy Nook. This view is looking north from near the cutting which was formerly the Dark Tunnel. The narrow section is where the canal crosses the Waterhouses Aqueduct. Immediately after the lock beyond, the canal turns sharply to the left and climbs the staircase locks, which can just be made out below the pumping station and house. 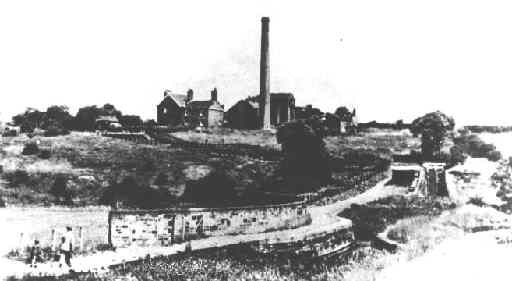 The Fairbottom Branch runs behind the pumping station and along the skyline to the right of the picture. The picture was probably taken around the 1940s or 1950s when the canal was still in water but starting to shown signs of disuse. The scene is very different today, with the canal route across the aqueduct being a bridle path and the surrounding area now densely wooded. The whole area now forms the Daisy Nook Country Park. More old photos of the canal can be seen on the website of the Hollinwood Canal Society.